about his iPad paintings on exhibit at the Royal Ontario Museum. 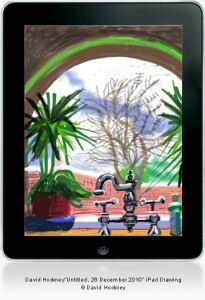 I visited his website and found his delightful drawings done with the brush app on his iPhone and iPad. Here is his website for you to go and visit. Also check out the ROM website. Great link to CBC Q, Jian does thoughtful interviews with muscians, writers and artists. Check out this website for emerging artists: http://www.artistaday.com.